Knowledge about the economic implications of refugee return is essential in order to develop adequate policies in the post conflict period. 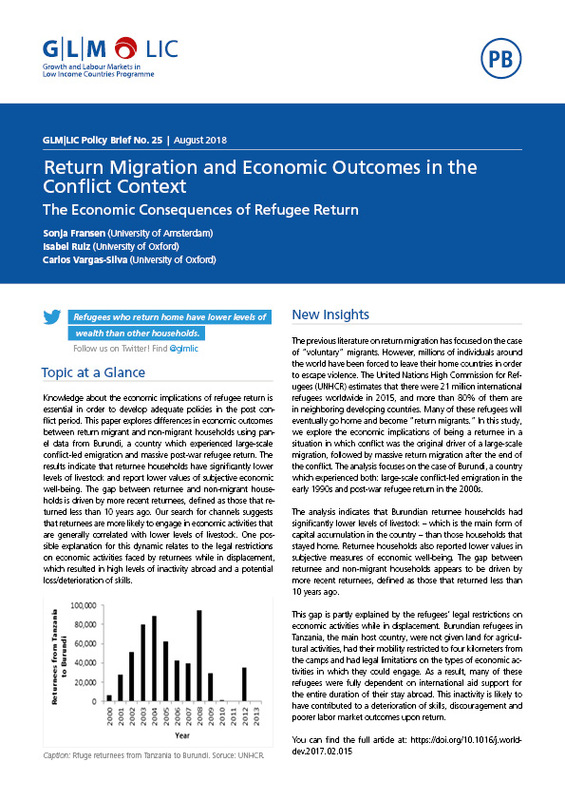 This paper explores differences in economic outcomes between return migrant and non-migrant households using panel data from Burundi, a country which experienced large-scale conflict-led emigration and massive post-war refugee return. The results indicate that returnee households have significantly lower levels of livestock and report lower values of subjective economic well-being. The gap between returnee and non-migrant households is driven by more recent returnees, defined as those that returned less than 10 years ago. Our search for channels suggests that returnees are more likely to engage in economic activities that are generally correlated with lower levels of livestock. One possible explanation for this dynamic relates to the legal restrictions on economic activities faced by returnees while in displacement, which resulted in high levels of inactivity abroad and a potential loss/deterioration of skills.